"Our people are survivors", Calliope's great-grandmother once told her of their Puebloan roots - could Bisabuela's ancient myths be true? Anthropologist Calliope Santiago awakens to find herself in a strange and sinister wasteland, a shadow of the New Mexico she knew. Empty vehicles litter the road. Everyone has disappeared - or almost everyone. Calliope, heavy-bellied with the twins she carries inside her, must make her way across this dangerous landscape with a group of fellow survivors, confronting violent inhabitants, in search of answers. Long-dead volcanoes erupt, the ground rattles and splits, and monsters come to ominous life. The impossible suddenly real, Calliope will be forced to reconcile the geological record with the heritage she once denied if she wants to survive and deliver her unborn babies into this uncertain new world. 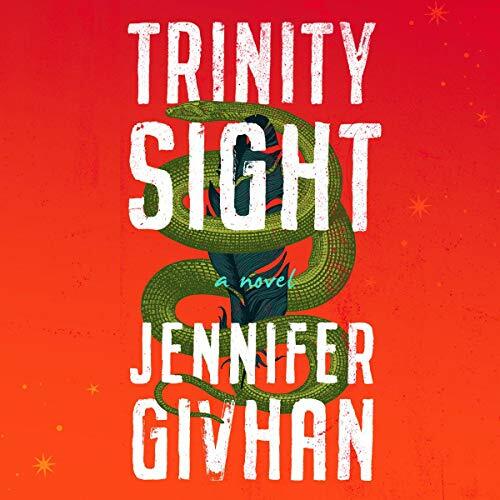 Rooted in indigenous oral-history traditions and contemporary apocalypse fiction, Trinity Sight asks listeners to consider science versus faith and personal identity versus ancestral connection. Lyrically written and utterly original, Trinity Sight brings readers to the precipice of the end-of-times and the hope for redemption. ©2019 Jennifer Givhan (P)2019 Blackstone Audio, Inc.